The bottom two black spots on the sun, known as sunspots, appeared quickly over the course of Feb. 19-20, 2013. These two sunspots are part of the same system and are over six Earths across. The giant sunspot was captured on camera by NASA's Solar Dynamics Observatory as it swelled to enormous proportions over the 48 hours spanning Tuesday and Wednesday (Feb. 19 and 20). SDO is one of several spacecraft that constantly monitor the sun's space weather environment. "It has grown to over six Earth diameters across, but its full extent is hard to judge since the spot lies on a sphere, not a flat disk," wrote NASA spokeswoman Karen Fox, of the agency's Goddard Space Flight Center in Greenbelt, Md., in an image description. The sunspot region is actually a collection of dark blemishes on the surface of the sun that evolved rapidly over the last two days. 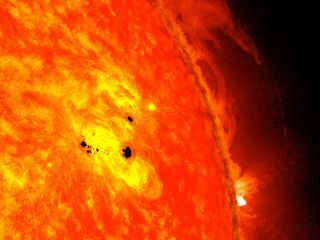 Sunspots form from shifting magnetic fields at the sun's surface, and are actually cooler than their surrounding solar material. "This is a fairly unstable configuration that scientists know can lead to eruptions of radiation on the sun called solar flares," Fox explained. NASA's Solar Dynamics Observatory launched in 2010 and is just one of a fleet of spacecraft keeping close watch on the sun for signs of solar flares, eruptions and other space weather events.